After the amazing success of last year I had no doubt that i would be able to secure funding for a repeat of the festival in 2015. Ideas Test informed me that it wouldn't be something they would be able to fund again as they only fund new ideas and they pointed me towards the arts council. Unfortunately, after filling out a lengthy proposal to them as well they also informed me that they wouldn't be able to fund it. 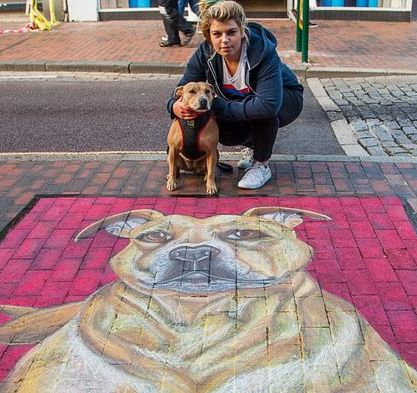 Their reason was they had had much better ideas to engage the public and they didn't think the quality of the artwork would be strong enough. This did't just leave me disappointed. It left me furious! I was determined to go ahead with the festival even if I had to fund it myself to prove them wrong. How right I was! 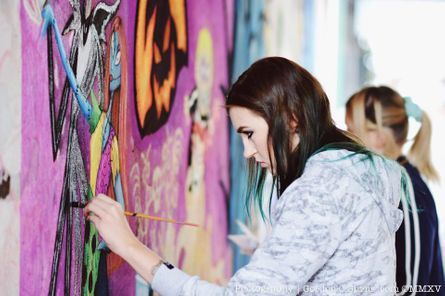 This years artists were all purely voluntary but there was still a good variety of professional artists all working alongside enthusiastic amateurs and the results were fantastic! At the last minute I received some funding from local Councillors which covered some of the costs but it was a hugely successful weekend. Thank you to Mike Baldock, Ben Stokes and Paul Fleming for their contribution. 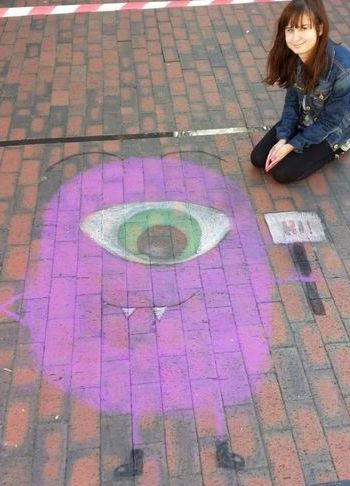 Lets start by highlighting all of the pavement artists. There was a loose theme of endangered animals but artists were free to create anything they wanted. 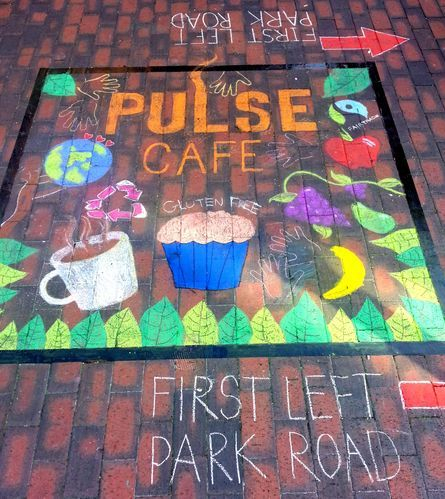 The Pulse Cafe kicked things off at the top of the high street with this colourful piece above, pointing the way to fine food and drink. 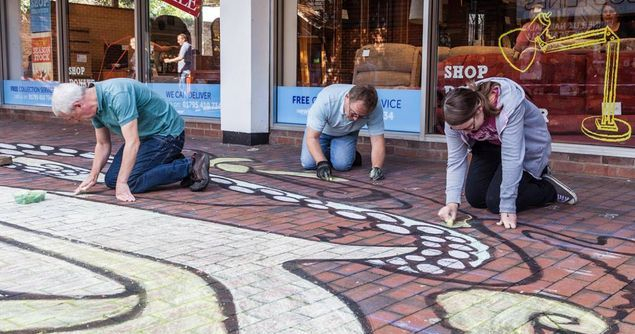 At the bottom of the High Street, opposite Baileys Coffee Shop, Jaime Richards spent the day creating large shapes and animals on the floor for the public to colour in. 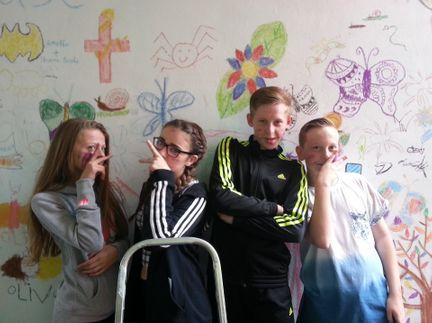 There was a lot more youngsters getting involved in creating artwork this year. This group just turned up in the morning and sat for most of the day chatting and talking on the pavement. 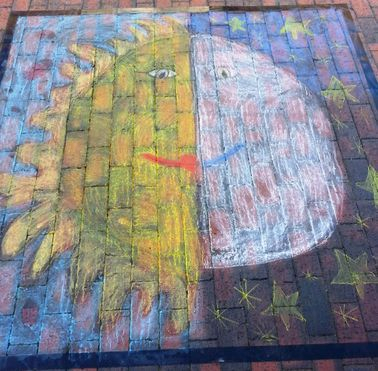 Lorraine Winchester, with help from local children, chalked this colourful rainbow design on the pavement beside Burtons Menswear. 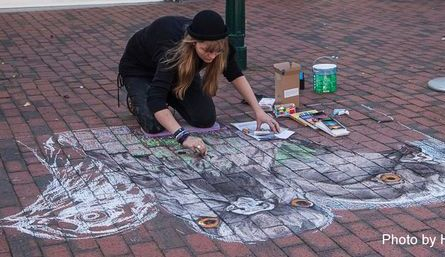 Professional artist Emily Sian Tull traveled up from Ramsgate to create this trio of pigeons on the floor outside Makaris coffee shop which really drew a crowd. 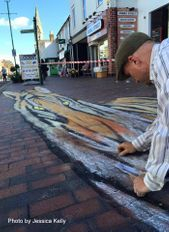 In the three hours I had spare on Saturday I managed to, with help from Chris Swain and Jessica Kelly (pictured above), create this 30 ft long anamorphic tiger sitting on Sittingbourne High Street. You can see a video of us creating this at the bottom of the page. 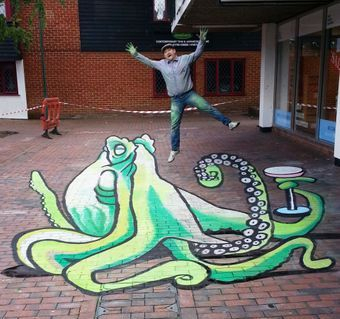 Anamorphic paintings are stretched out so that when viewed from the correct point they appear three dimensional. 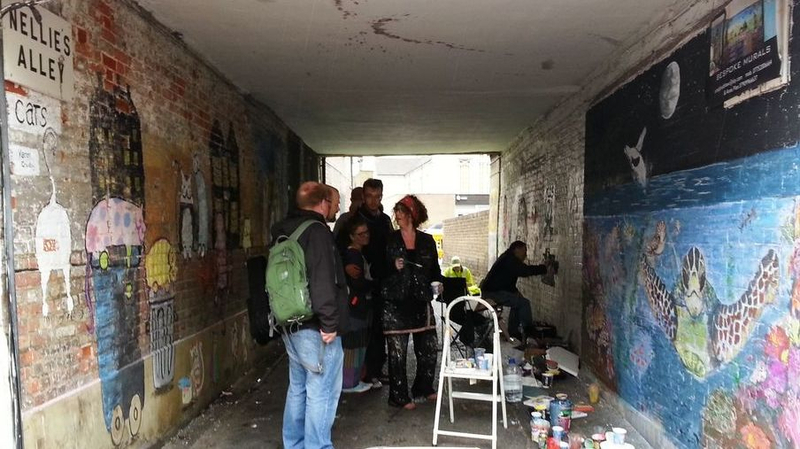 We were really lucky to tempt some new artists to create artwork in the alleyways this year along with many of the artists who had fun last year. 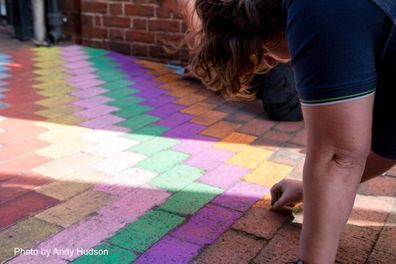 This is the perfect chance for artists with limited movement to get involved as crawling around on the floor and chalking is not easy on the knees and back. 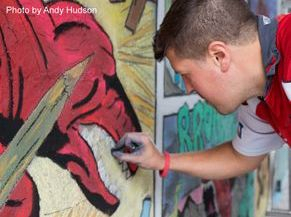 Also, because most of the alleyways are under cover it means that the artwork is well preserved throughout the year. 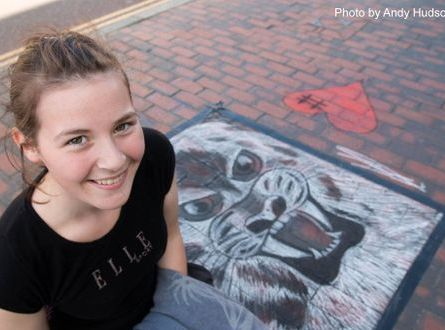 At the top end of the High Street in the alley beside Thomsons travel agents artist Kandice White led a team from The Kent Wildlife Trust in creating this lovely true to nature mural on the wall and encouraged children to draw their own wildlife animals on the wall opposite. 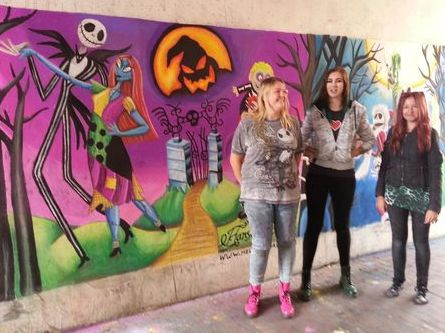 The Hanson sisters, Mel, Louise and Nazine, made a welcome return to Chalk It Up this year as they spent the weekend rejuvenating last years artwork and extending it further along the wall. 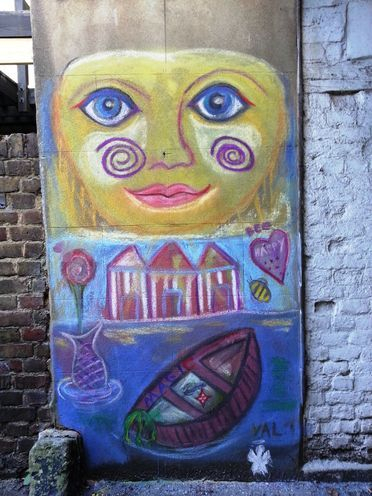 Spiritual artist Val Tyler worked in one of the alleyways to create this colourful design. One of our busiest alleyways was Nellies Alley beside the pet shop. 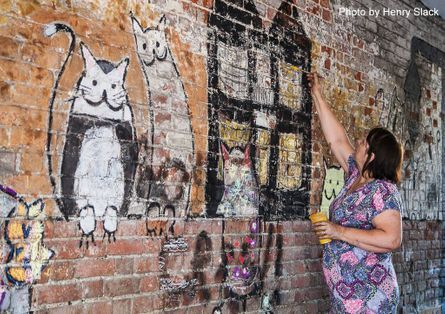 On one side of the alley was Karen Crosby and her sister creating Alley Cats with help from the children. 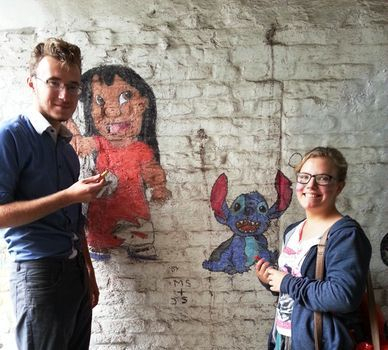 Jordan Spooner and Matt Scamp teamed up to chalk cartoon characters Lilo and Stitch also in Nellies Alley. 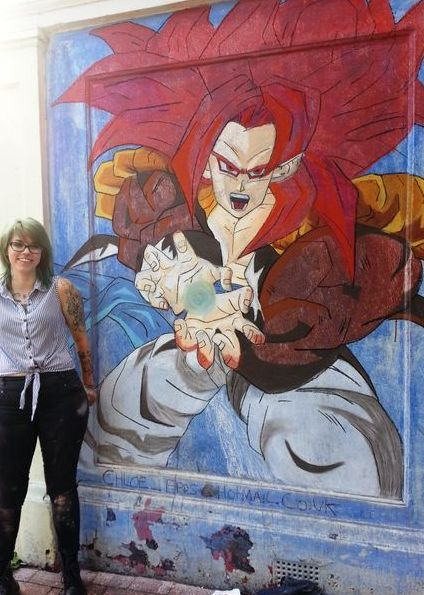 Chloe Taylor is a talented self taught artist who is a big fan of Manga and Anime art and she created this colourful work on the side of Haswells Coffee Shop. 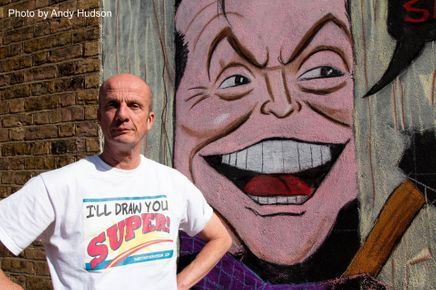 In the first of the three windows on the side of The Edinburgh Woolen Mill Mark Thatcher was back once again to create one of his cartoon masterpieces with his take on the film The Shining. 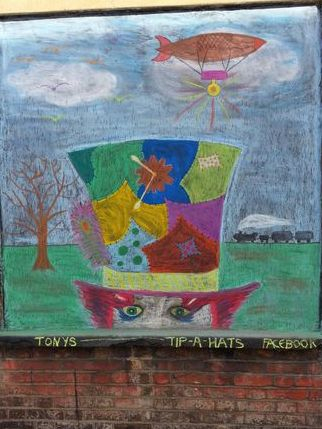 In the second of the windows we had a first timer in Tony Sanger who created this Steam-punk influenced offering. 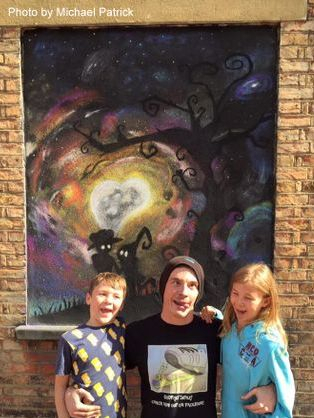 It was also Michael Patricks first time as a street artist and he turned it into a real family event getting his children to help as he chalked the third window. 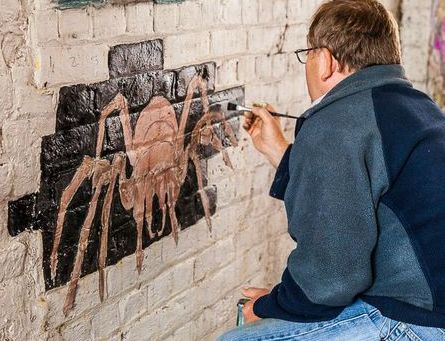 Henry Slack came to last years festival as a photographer but this year decided to pick up the chalks to become one of our busiest artists of the weekend. 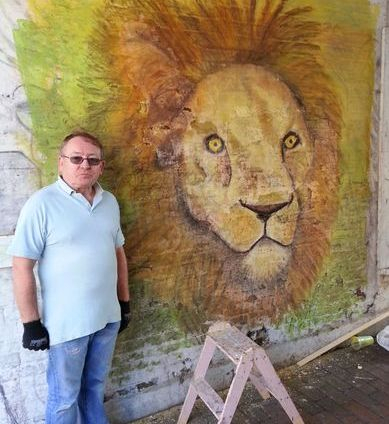 The created this great lion head in one alley and a scary spider in another alley and also helped create the Giant Octopus floor mural that you can find more details about at the bottom of the page. 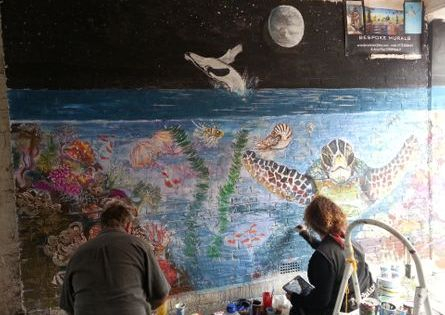 On the opposite wall in Nellies Alley worked artist Julie Bradshaw who spent the weekend creating this wonderfully detailed underwater scene with help from her partner, Dave. 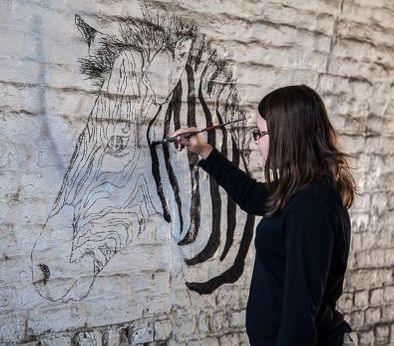 Myiesha Childs also worked in Nellies Alley and created this amazing Zebra created with chalk paint. 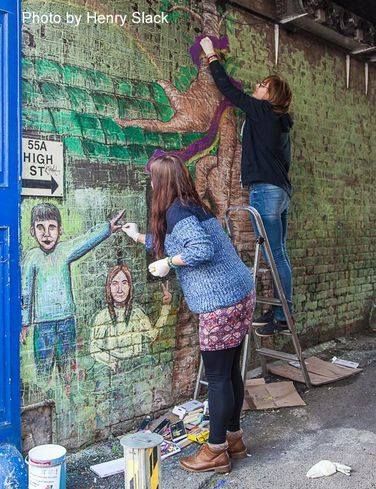 At the very bottom of the High Street we gave a welcome return to #Dinoslaps in the form of Danny Barthorpe, Marcus Tyler and James Allford, three guys that create murals with a dinosaur theme. 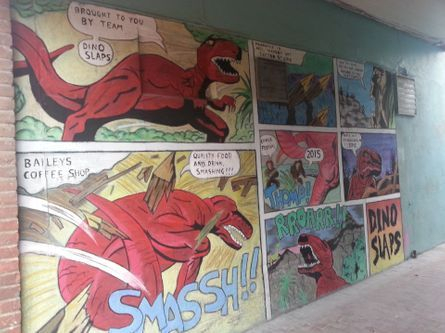 This year they created this comic strip promoting local businesses. I had planned this for the Sunday of the weekend but, unfortunately, we were rained off so this was created the following Saturday. 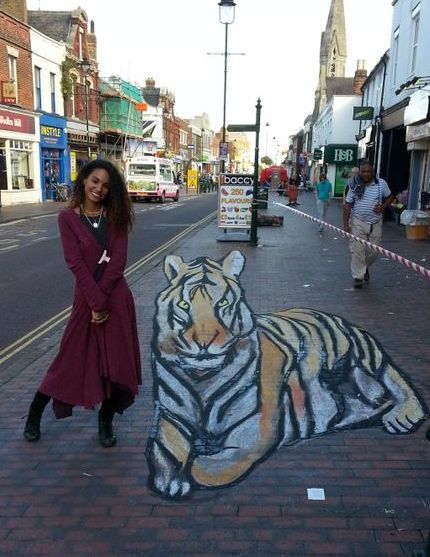 It took about 6 hours to create with help from Henry Slack, Myiesha Childs, Andy Hudson and Jack Rawlinson. 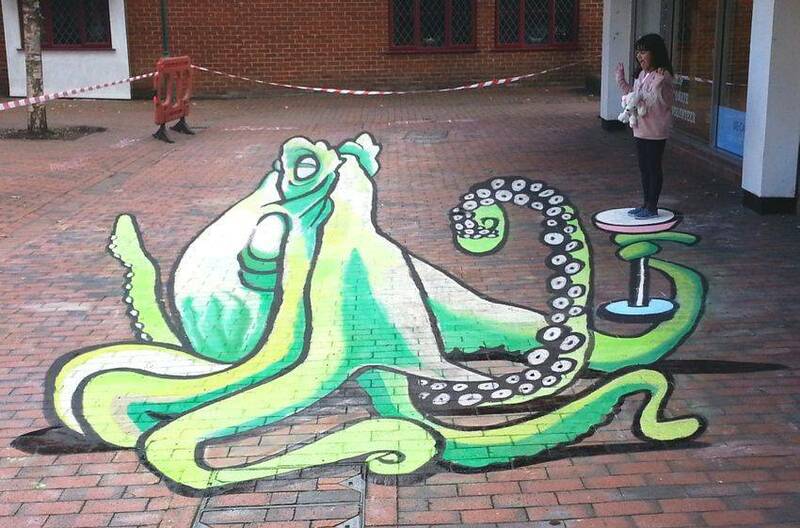 It measures 14 foot across and is over 50 foot long to create this illusion of a Giant Octopus in Roman Square. 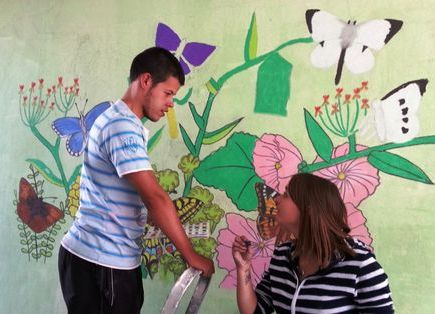 Thank you to Isabella Garrett-Olguin for posing for this photo. 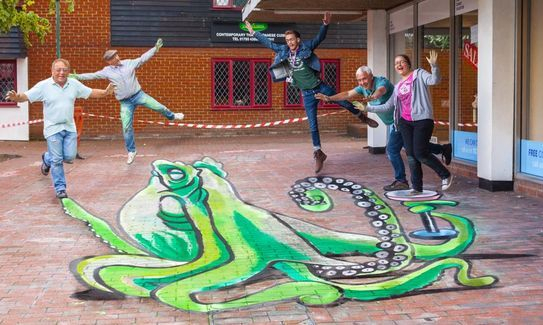 Below you can watch time-lapse films of us as we create the Giant Octopus and the Tiger. Just click on the pictures to play them. 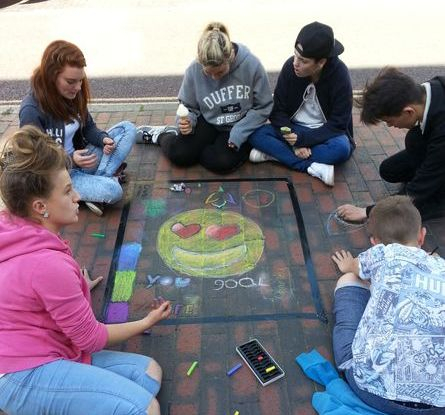 Despite the limited funding this year the festival was a roaring success that built on what was created in 2014. There was definitely more crowds this year with people making the trip to visit Sittingbourne from right across Kent. 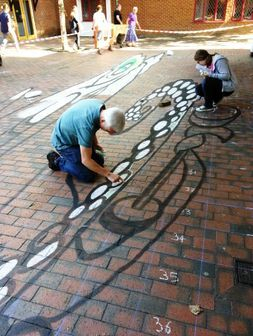 We had over 30 registered artists in all with a lot of public interaction this year. 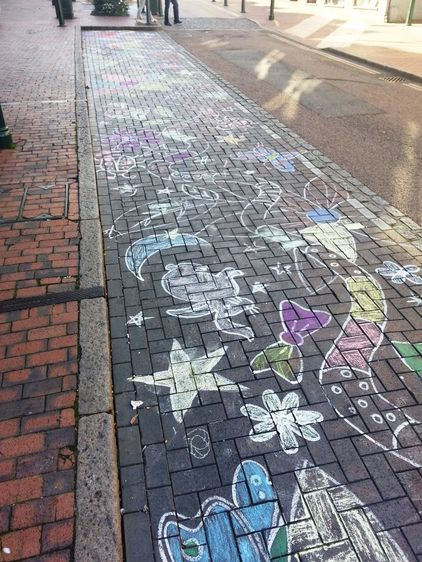 Youth engagement really increased this year with children across all ages picking up sticks of chalk. Makaris Coffee Shop commented to me after the event that they didn't realise the festival would bring so many people into the town. They told me that they would be getting extra staff in if we run it next year due to how much busier they were than normal.